I mentioned in a previous post that I was sold on buying a Playstation 4. Here’s that post: Has the Playstation 4 Finally Done it? Well, I did just that. 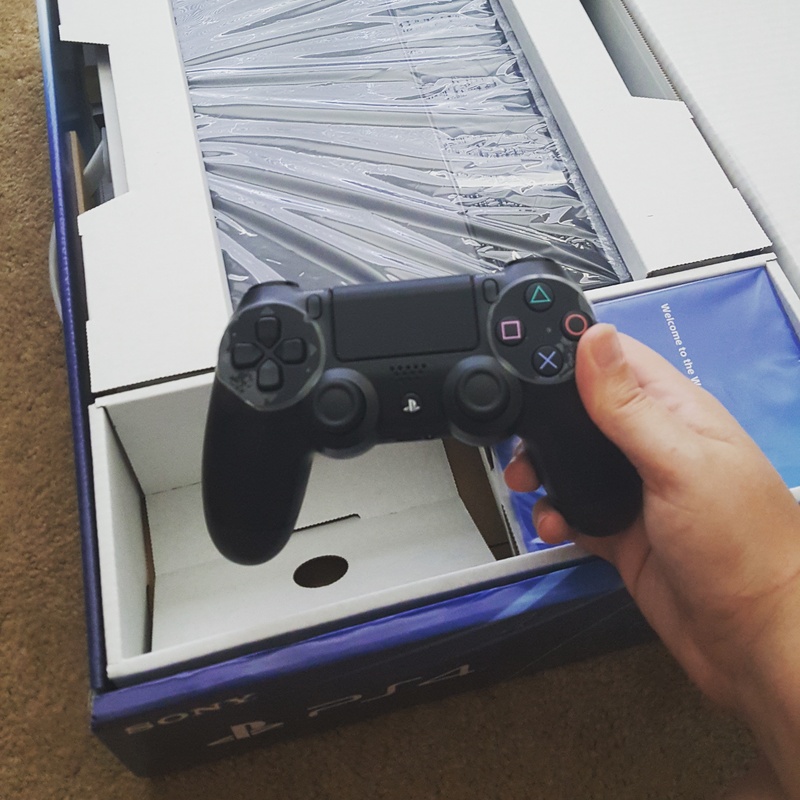 I purchased a bundled PS4 via QVC.com, believe it or not. I really wanted to get the console as soon as I could without paying the full price. Instead of making my wallet cry, I’ll be making 5 payments of $115.70 for the 5 months. Pretty affordable that way, if you ask me! 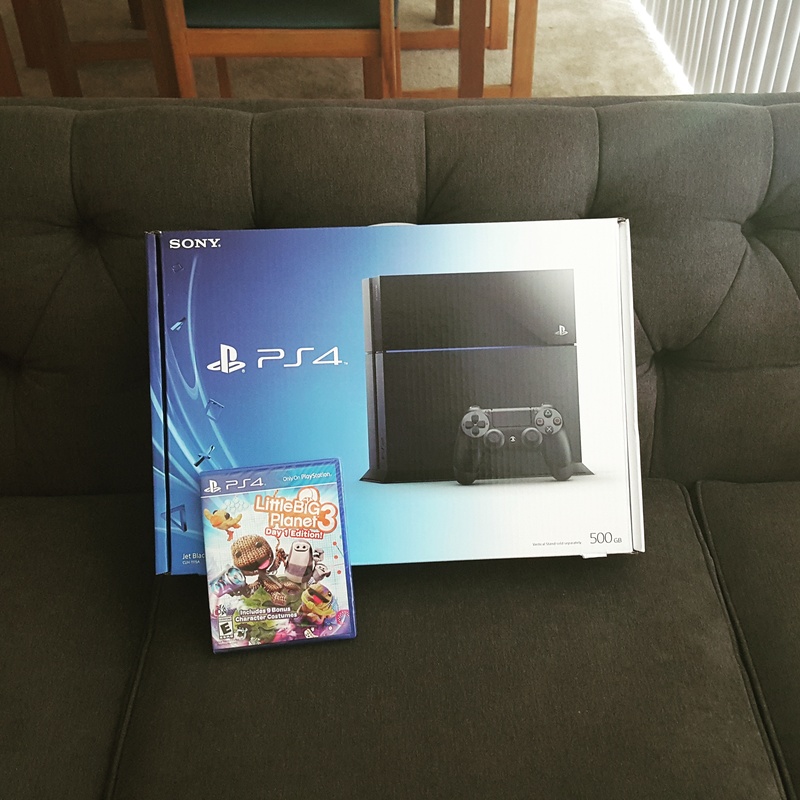 It took about a week to get to me, and it was worth the wait to unbox a brand new console. I was beyond giddy just to open it! It felt like Christmas to me. After all, It has been about 5 ½ years since I’ve bought a new console. If you’re a gamer, you know how tragic that is! Hence why I was like an overexcited child when opening my new PS4. It was awesome-sauce. So after 5-6 years of mouse and keyboard gaming, I’m holding a controller again. It’s weird and a little awkward, but so far I love it. I didn’t realize how much I missed the feeling of holding a controller in my hands! I could easily compare this to going from reading a hard copy book to an e-reader. The feel of it just isn’t the same, especially if you started old school. And can we just take a moment to revel in how much more comfortable the modern day controller is to the original? Ok, let me get something straight. I have played on a PS4 sparingly; courtesy of having an older brother who can keep up with the times. The games we played were mostly multiplayers. We’re talking Mortal Kombat, Little Big Planet, and others that I can’t recall the names of. I guess if you’ve gamed long enough, you never really lose the ability to pick up a controller and play decently with it. That was the case when I gamed with my brother. The big challenge now is acclimating myself with a console controller with more depth than just the occasional multiplayer game. 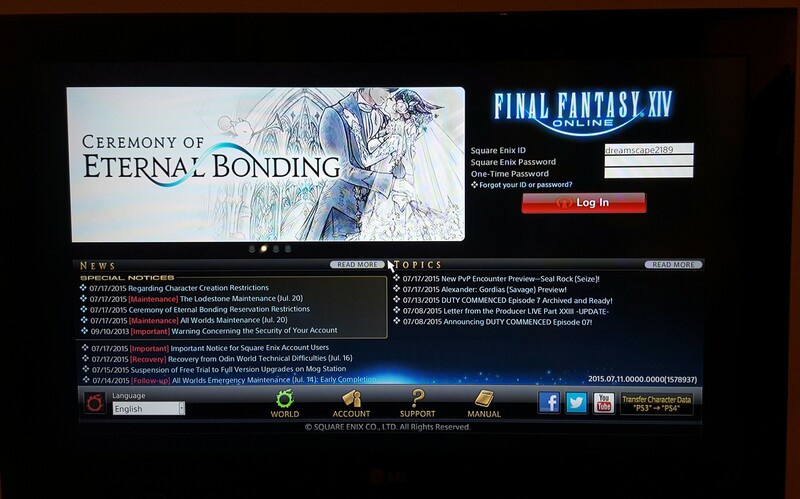 This acclimation is occurring now as I begin to play Final Fantasy XIV: A Realm Reborn on the PS4. It’s sort of a sink or swim situation as you really have to utilize every button and combination of buttons on the controller to access everything there is in FFXIV. The idea of using those methods made this PC online gamer pretty nervous. My thought: How in world do you access it all via controller? At first, I was gimped by the controller. I immediately wanted the security blanket that was my mouse and keyboard. I did give in to that a bit. I purchased a USB keyboard in order to chat on the game, but I found myself regularly setting down the controller and opting for the touch pad on the keyboard. Shame, shame, I know! Everyone kept telling me that I can just hook up a USB mouse and play it like it was PC. But where is the fun in that? Where is the challenge in that? I wanted to give the controller a real chance at winning me over. Within two hours of gameplay, I was intrigued. I was relieved at how easy it can be to access everything once you get the gist of how it’s all done. It took me about an hour to learn how the Hotbar Sets work and then to set them up. After that, I jumped right in two dungeons to see how everything flowed. It went surprisingly well. I think that the more time you spend acclimating yourself to the controller’s handling, the more comfortable and better off you’ll be. I’m even tempted to say that it could be quicker than PC, but I’ll hold off on concreting that until I get more game time under my belt. My Verdict: I’m digging it! I will continue to play FFXIV: ARR with the controller until I either love it or hate it! We shall see and I will update everyone on the results in a few weeks. Do any of you play a PC game with a controller? How do you like it? Has anyone gone from long-time PC to Console or vice versa? How was that? This entry was posted in All, Geek Culture, Video Games and tagged console, console game, console gaming, FFXIV, FFXIV: ARR, Final Fantasy, final fantasy xiv, gamer, gamer girl, games, gaming, geek, geek culture, geek girl, geek life, geeky girl, keyboard, little big planet, mmorpg, mortal kombat, mouse, multiplayer game, nerd, nerd culture, nerd girl, nerd life, nerdy girl, online game, online gaming, pc, pc game, pc gaming, playstation, playstation 4, playstation bundle, playstation controller, qvc, rpg, sony, video games, video gaming. Bookmark the permalink. Controllers were actually the reason I got into FFXI and FFXIV. I’m the exact opposite where I can’t use a mouse a keyboard to save my life with controls. My left hand seems to cramp up trying to move with the WASD keys. Honestly, if both XI and XIV were PC only and had no controller compatibility, I probably would have missed out on the games entirely. I’m finding that I am glad that FFXI and FFXIV decided to go both PC and console. It really did open up a lot of avenues for people not accustom to keyboard and mouse, like you. I think it has really expanded the variety and number of gamers that play FF’s mmo’s. Absolutely! Gaming with a controller is the only way I know how to play! While keyboards and mice (does that word even apply to computer hardware? Feels so weird to type!) definitely provide a great sense of control and even perform better in many occasions, I love the controller. Mice! Yes, I think it does, but I’m forever picture the small furry cute versions. I am definitely having a good time! I just wish I had more time to play. The boyfriend isn’t a gamer and so he doesn’t grasp that I can’t get much done in an hour. 😛 I’ll be posting about that today actually. Stay tuned! Also, got your request. Yay. Yes! Glad we got that somewhat settled, it’s been bugging me for some time now. Yeah, unfortunately you really have to make time for these things. I mean at least it’s not FFXI where you couldn’t really get anything done in an hour. FFXIV is at least a little better in that aspect. FFXIV is definitely better than FFXI. It took an hour just to run from Point A to Point B in that game. Geez. Maybe we will! You’ll have to let me know what your character name is so I can keep an eye out, haha. 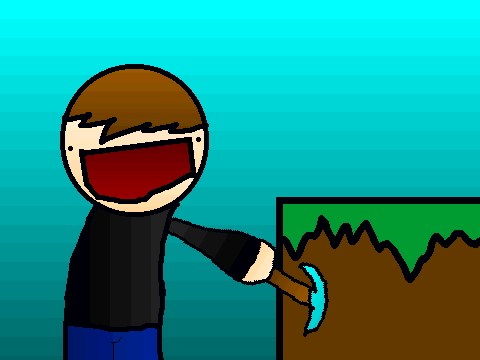 I was considering transferring and then my brother transferred to my server to play with me. That and my FC actually didn’t kick me so I was super excited to still be a part of that group.